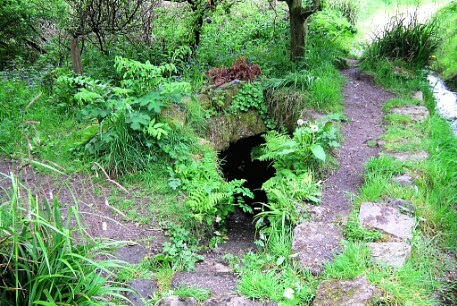 West Penwith is dense with ancient sites. They aren't as dramatic as some sites elsewhere, such as Stonehenge, Avebury, Callanish or Carnac, yet they're lovable and today they are much loved, set in a landscape still alive with a magic atmosphere. 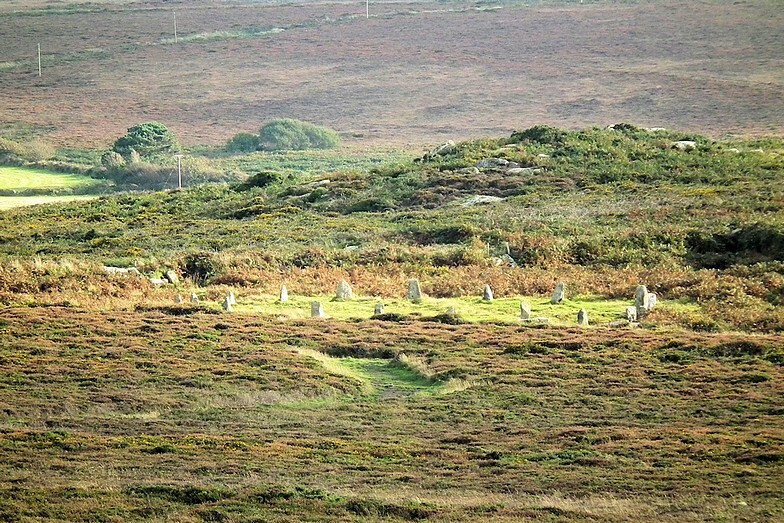 In this Ancient Sites section of the website, we shall go through the different kinds of prehistoric sites that exist in Penwith, starting with the oldest first. The Ancient Sites in West Penwith, Cheryl Straffon, Meyn Mamvro, 1992-2015. Cornovia - the ancient sites of Cornwall and Scilly, Craig Weatherhill, Halsgrove, 2009. Belerion - the ancient sites of Land's End, Craig Weatherhill, Alison Hodge, 1981-89, out of print. Journey to the Stones, Ian McNeil Cooke, Men-an-Tol Studio, 1996, out of print. 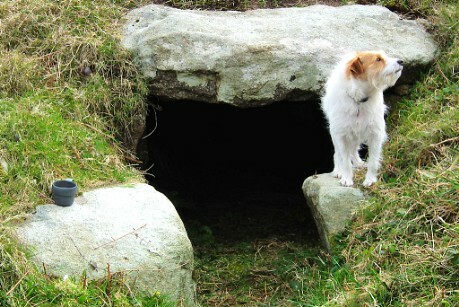 Many local sites are cared for by CASPN, the Cornish Ancient Sites Protection Network, a local volunteer-run group. In 2018 the Lottery-funded Penwith Landscape Partnership has also joined this work. 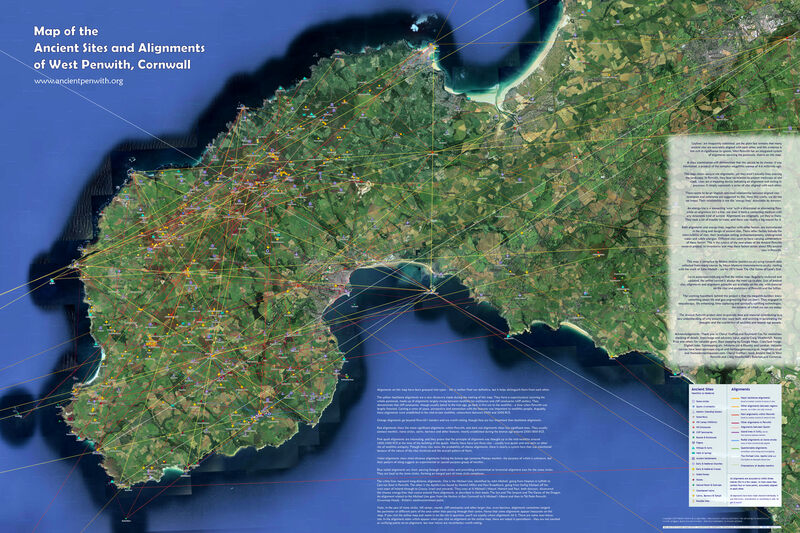 Below is a map of the known ancient sites in West Penwith. See the map in detail on Google Maps or downoad a large JPG image of it, to keep. Penwith is a distinctive, mostly cliff-bound, island-like area, with a magical atmosphere and a Cornish ruggedness both to the land and its residents. Trencrom Hill and St Michael's Mount act as gateposts to the peninsula. Nowadays, Penwith is at the end of the road, far from England's cities, but in ancient times it was a central marine node on the Atlantic seaboard. Neighbouring areas - the Lizard, Isles of Scilly, Kerrier and East Penwith - form a backdrop to the visual and geomantic landscape of ancient West Penwith. Four and more millennia ago, long-distance travel and goods transport was often by sea and river, since much of Britain was forested. Long-distance, woodland trackways were not easy to navigate and use of horses was yet to start, around 1200 BCE. Penwith was then more centrally-placed than it is now. It stood at a marine junction for boats travelling from Brittany and Iberia, the English Channel and Bristol Channel, and from Wales, Ireland, Scotland and the Hebrides in the north. Its main harbours were at St Michael's Mount (not by then an island), St Ives and Carnsew (near Hayle viaduct). Its rich deposits of tin, gold and copper made Penwith prosperous, extending its reach through chains of traders as far as Ireland, Germany and the Mediterranean. 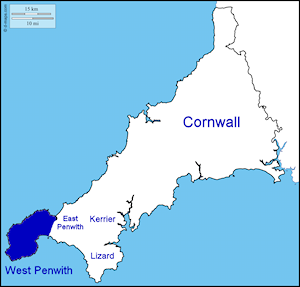 Following the Roman occupation of Britannia in CE 43, through the Saxon, Viking and Norman invasions and up to the Middle Ages, Cornwall was not romanised or anglicised as early or as much as the rest of England. Neither was Cornwall subjected to the same oppressions that the Welsh, Irish and Scots experienced from the English over the centuries. This permitted a certain cultural continuity in Cornwall. It doesn't have much of a history of warfare either. the capacity of the Cornish to dig and move rocks and build with them. Perhaps there were also certain inspired characters over the generations who set megalithic projects in motion, developing ideas, technologies and the leadership to do it. the iron age (800 BCE to CE 200). These periods are based on artefacts and metals used in them - they do not reflect changes in society or the ideas or spiritual-cultural impulses of the time. Building and using the ancient sites was the biggest thing people did in those times. The megalithic era went through two key periods, the first, in the neolithic, of 500ish years, and the second of over a millennium in the early-to-mid bronze age. More about this lower down. 1. Ancient sites don't exist in isolation. They are part of a larger system. They are positioned according to a variety of factors, including alignments, intervisibility, underground water, energy-lines, geology, the rising and setting points of sun and moon and the site's visual setting in the landscape. 2. If a site is dated to a certain period, this might not have been its first use. A proportion of West Penwith sites are incorrectly dated because their use can in many cases have started before construction was started there. 3. West Penwith is more of an integrated system of ancient sites than has previously been known. To these should be added various kinds of settlements, roundhuts and courtyard houses, together with trackways, fords, bridges, farms and field systems. 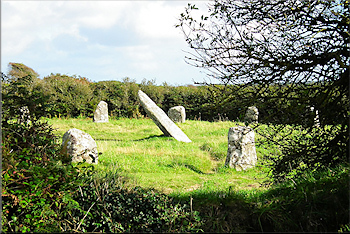 The megalithic era in West Penwith had two main phases, both sparked by incoming ideas and people. Human development doesn't follow an even course. It started around 3700 BCE with the building of the first constructed sacred sites - the neolithic tor enclosures and quoits. After a lull around 3200-2900, an upturn around 2600-2200 gave rise to the four-century bronze age zenith around 2200-1800 BCE. Then came a slow decline around 1500, when there was little building of new sacred sites, leading to the end of the megalithic period around 1200 BCE. They had moved from the centre to the edge of society over 600 or so years. There followed a more material late bronze age culture, with more capital-intensive farming, village life, the emergence of weaponry, increased social stratification and loosening clan relationships. This morphed into the iron age or Celtic culture, lifting off around 800-600 BCE. Iron age culture had stronger leaders and aristocracies, and Britain's tribes were moving toward statehood. But they still held beliefs that had roots in former times. Back around 2000 BCE, the bronze age zenith in Cornwall occurred at the same time as Dynastic Egypt and Minoan Crete. A prominent Atlantic coast culture stretched across Britain, Ireland and Brittany, from Portugal to southern Scandinavia. West Penwith was centrally placed in it. In the pages that follow we shall be examining the different kinds of ancient site in West Penwith, roughly in order of their age - oldest first.